Snowboard bindings use the same 4x4 binding insert pattern as high quality, wood core skiboards but provide no lateral support, which is critical for skiboarding. What this kit does is convert your snowboard bindings into soft boot skiboard bindings that will work with any 4x4 insert equipped skiboards. You simply need to screw the provided Saavi wings onto your binding's highback with the supplied machine screws. As long as the highback has openings in it, you are good to go without any drilling necessary, just a Phillips screw driver is required. After attaching the wings to the highback you just attach the snowboard binding and supplied RVL8 "Missouri" riser into the inserts in your 4x4 skiboards and you are ready to ride! No home tinkering or mechanical work required. If your highback has no openings, or if the opening is not large enough, you will need to drill two small 5/16" holes in each highback to allow the attachment of the wings. Here is a video showing how to attach the Saavi Hooks to snowboard bindings without highback openings. 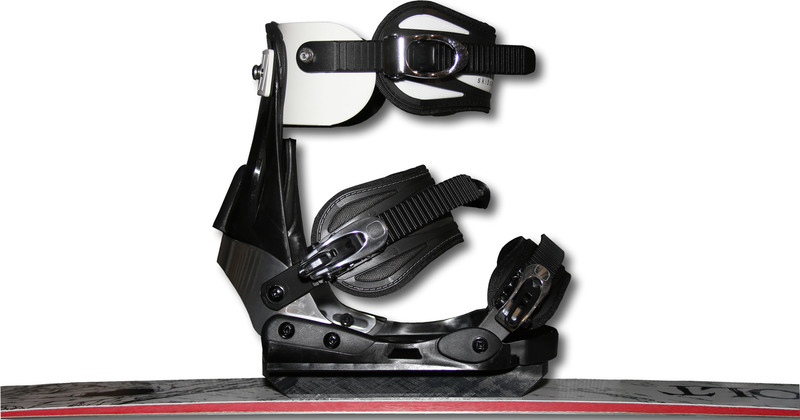 I noticed that Greco has added the long awaited RVL8 Snowboard binding conversion kit to the store today. http://www.skiboardsonline.com/p/rvl8softboo tkit.html I have had a lot of experience testing and developing this kit and I think it is really something the skiboard market has sorely needed and kudos to Greco for bringing it to market . What this kit allows is for someone to convert essentially any snowboard binding into a soft boot skiboard binding that will allow that binding to be used on any 4x4 insert equipped skiboard with standard soft snowboard boots. The user simply needs to bolt the wings onto the highback of any snowboard binding with the supplied machine screws. As long as the highback has openings in it , you are good to go without any drilling necessary and just a phillips screw driver . The wings have a pre attached rachet strap already supplied . After attaching the wings to the highback you just attach the snowboard binding with the supplied screws through the holes in the riser into the inserts in the skiboard and you are ready to ride ! No home tinkering or mechanical work required . Just a screwdriver . If your highback has no openings and you have the rare snowboard binding with a completely solid highback then you will need to drill two small 1/4 inch holes to allow the attachment of the wing . I have used this conversion kit with a variety of snowboard bindings and I have supplied a previous post with details about the best snowboard bindings to select . http://www.skiboardsonline.com/forum...ad.ph p?t=14988 How well the binding performs after conversion does depend on the selection of a proper base binding so I do recommend the user consider carefully which snowboard binding to convert. I also recommend for best performance a relatively stiff snowboard boot , 3/5 or 6/10 or above stiffness on snowboard stiffness rating scales. The bolt on wings and rachet straps are bomber in quality and durability . and stay on rigidily despite crashes and extensive use . The riser is a thing of simple lightweight beauty that provides a firm connection between board and binding . With the proper base binding and proper moderately stiff to stiff snowboard binding the whole set up will be a high performance skiboard binding allowing aggressive carving of skiboards with snowboard boots . Ps . Greco does supply the lightweight "Missouri" riser designed by Bill here on the forum by itself as well. If you have a double winged binding such as some of the cool Technine double scrub hook bindings , you can then just buy the riser alone and a pair of snowboard rachet straps and drill and attach the straps to the wings of the binding yourself to create a similar set up at a lower cost .